I replicated an early 2000’s wedding bouquet. They were compact, textural and velvety gothic. The wedding bouquets I did at this time were never bigger than a dinner plate and were framed in NZ muehlenbeckia vine. We often used a beautiful wee rose called ‘Black Beauty’ accompanied often by black dried idesia berries, succulents and gloriosa lily blooms. One of those bouquets had a wonderful dramatic long vine trail like the one here. This represents the use of a lot of dried textures that has become very popular lately. 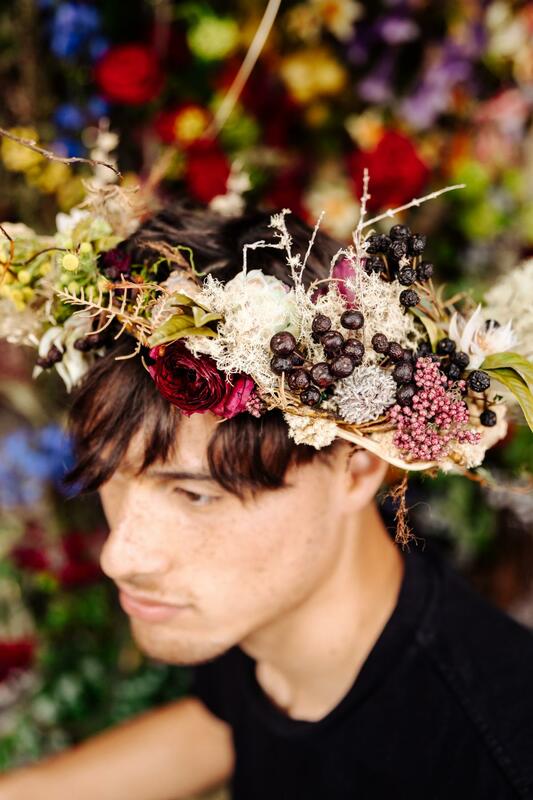 We have always loved the use of beautiful dried flowers and foliage such as lichen, branches, grasses and berries. We love that people can see the beauty in those things. 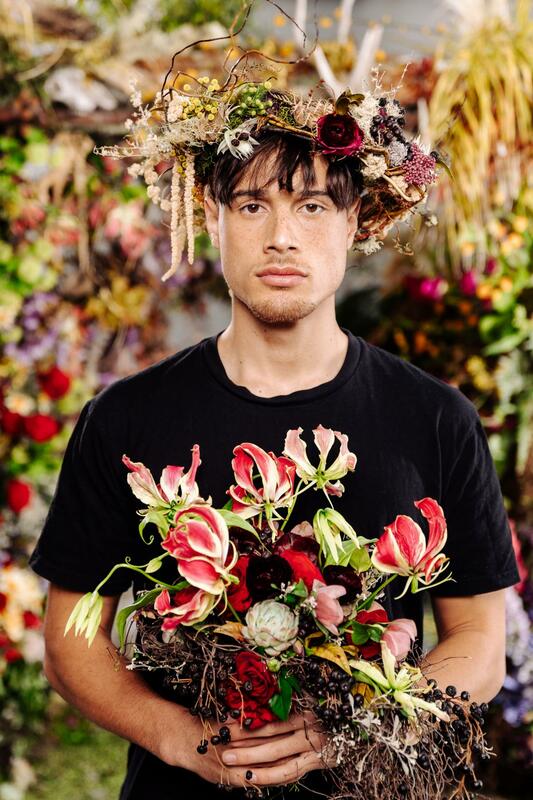 I photographed the crown on a male model as a celebration of the fact that flowers crossed stereotypical gender boundaries. 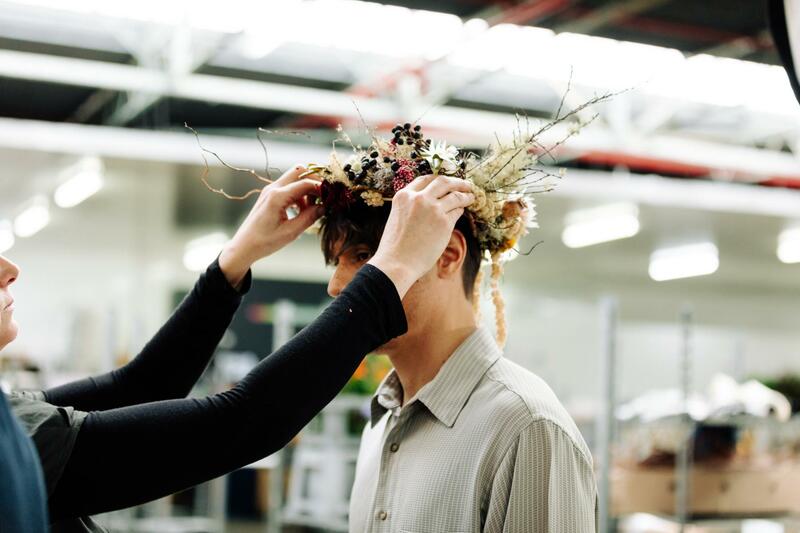 Hair flowers and adornments have become a regular order to celebrate special occasions. 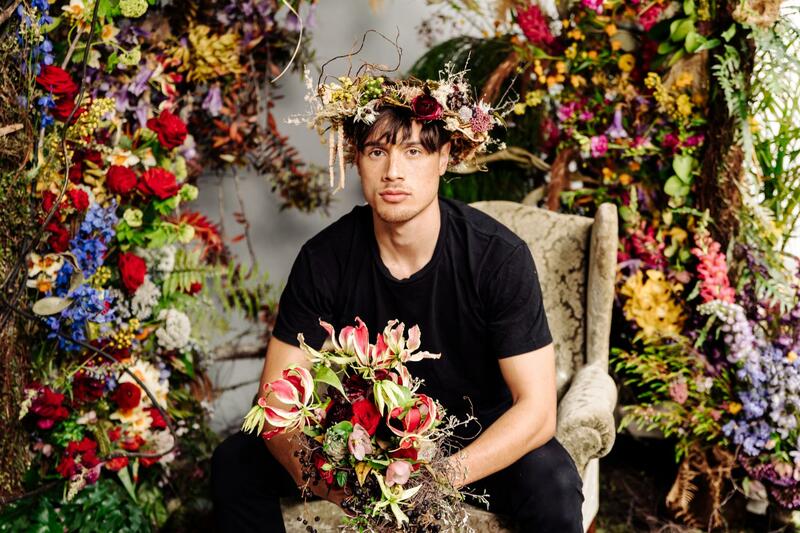 We are seeing a lot more interest in people having floral installations as mood settings and photo op backgrounds. They can be large or small and installed anywhere to create a mood, a sense of a story waiting to be told. We have always been conscious of our environmental footprint and constantly strive to be waste free and sustainable. This arrangement has been created using recycled orchid vials, re-usable wire, compostable ties and an old paint scaffold. 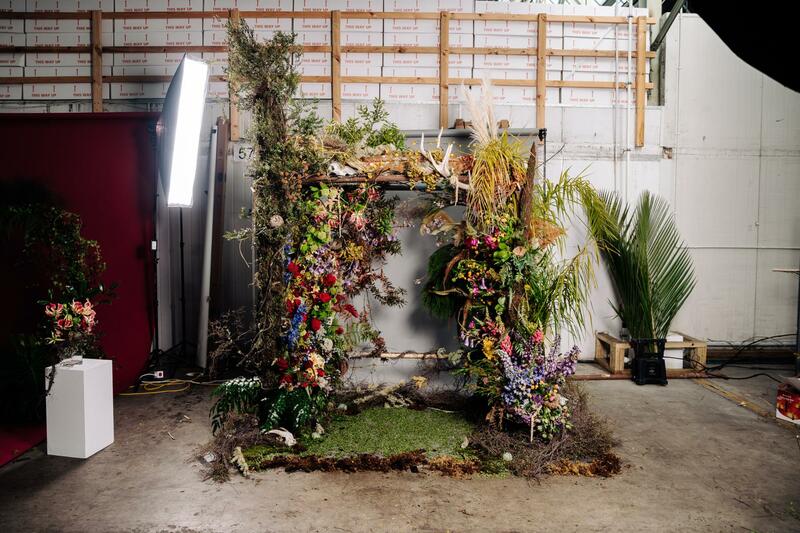 Everything used in this installation is grown in NZ. We only use NZ grown product in our shop. I’d love to see more availability of NZ natives to celebrate the beautiful foliage. In this piece is a beautiful Kauri sapling. They are currently under threat of extinction. We should plant more of these majestic beauties. I love NZ product.